The waterfall in morning sunlight. 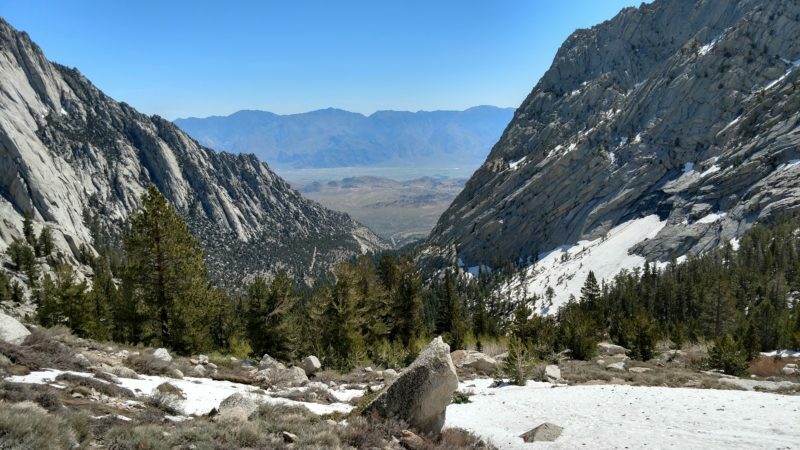 This post is the final chapter in a five part story about Mount Whitney. If you haven’t read the previous installments you can find them here. 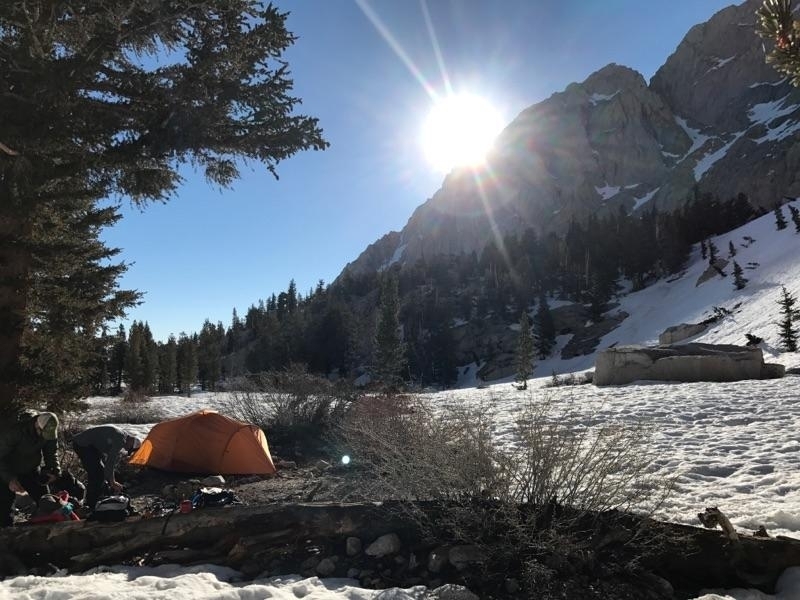 We awoke to a beautiful morning at Bighorn Park; the sun radiated off of every surface, the snow glowed brightly in the light, and some hot coffee hit the spot. We weren’t in a hurry, but we had no intention of spending the day either. We started to pack up, and Matt came around having taken possession of Cindy’s backpack. We offered him more coffee and he gladly accepted as he searched the bag for identification. “It’s going to be a pretty big show around here if you guys stick around,” he said as we all watched a hiker coming down the mountain beside the waterfall. “I think we’ll be on our way before the helicopter gets here,” I mentioned. “I don’t want to be a looky-loo. If I could help, I’d want to stick around, but I’m not experienced enough to do much up here.” Matt nodded, knowing I was correct but happy he didn’t have to say it himself. We chit-chatted as Tim and I took apart the fire ring, and we noticed the descending hiker was Andrew. “Yeah, you guys made the right call when you decided to turn back last night. It took me two more hours to get to Outpost Camp. I had to finish in the dark.” I was glad to see Andrew was safe, but I also felt vindicated that we had made the right call when we bailed. “I got up early this morning to try to summit,” he continued, “but there was no way. Absolutely no way. 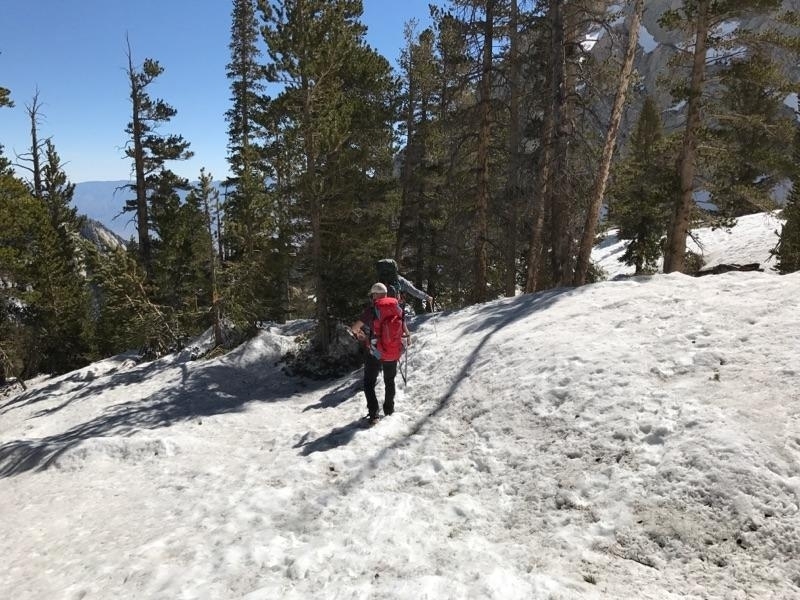 I was postholing to my chest in the snow at some points.” We introduced Andrew to Matt and the five of us talked about conditions on the mountain for a few minutes. Then Andrew left Bighorn Park and continued on his way back down the mountain. “How many times have you summited,” I asked him. As Tim, Jon, and myself left Bighorn Park and set off down the mountain, we stopped by the young couple’s camp. They were still in their tent, and mentioned that they planned to try for the summit in a bit. We cautioned them against doing so, and reiterated some of the stories we heard. Ultimately, they had to make the choice, but we wanted them to know what they were getting themselves into. They too decided to pass on the summit on this trip. We had several similar conversations with hikers along the way; some had only a day pass for the mountain and believed they could summit. 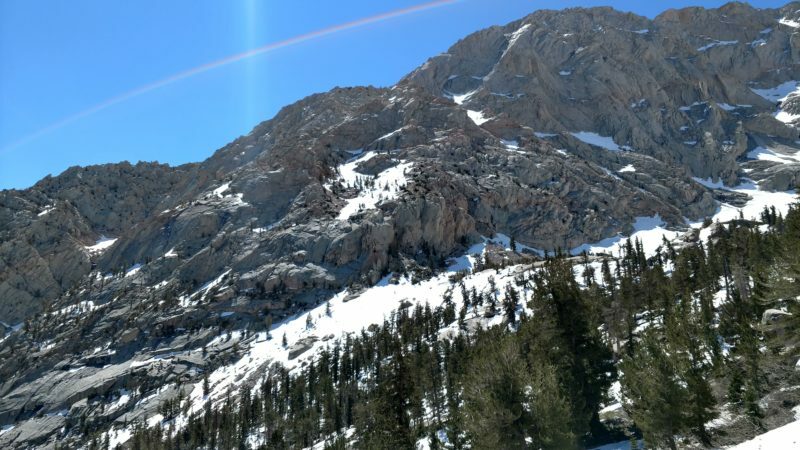 Maybe I’m just an inexperienced midwesterner, but it’s hard for me to believe that anyone who isn’t the elite of elite performers could do Mount Whitney as a day hike in those conditions. In August with no snow, sure, but not in these circumstances, not with fifteen feet of snow in some spots. We didn’t want to be negative, but again, we wanted these hikers to know what they were hiking towards. Heading back down Mount Whitney Trail. The sun was already starting to break up some of that snow, which proved unhelpful. We sunk, slid, postholed, and fell. I’m grateful that I had the crampons and the ice axe, but at times I felt snowshoes would have been more effective. As we reached the last of the ice and snow, we saw the Chinook circling overhead. Again, I felt a chill, despite the warm sun. 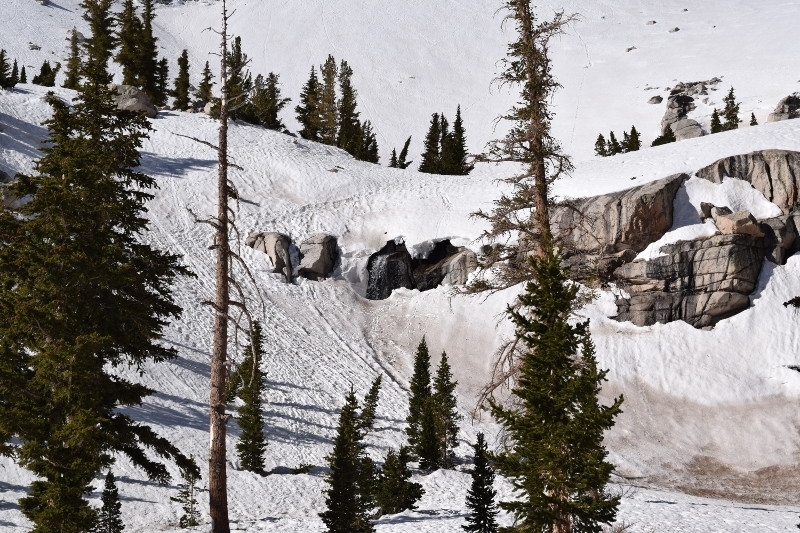 Once we left the snow and removed our crampons, we descended quickly. The streams that we had crossed so easily the day before had more than doubled in size, swollen from the melted snow. We took great care crossing them; that water moved quickly, and looked pretty deep in some spots. We managed to cross safely though, and continued kicking up dirt on our way down the trail. Where the trail turns back to dirt and stone. Anticlimactically, we returned to the trailhead, unloaded our packs, and drove away from the mountain. As we kicked up dust on the way to Lone Pine, I looked back at Mount Whitney. I didn’t reach the summit, but that’s okay; I intend to come back for that. In spite of the need to bail out, or perhaps even because of it, I had an experience quite different than the one we had expected. Sacred. Hallowed. Holy. I saw Mount Whitney’s beauty, and her cruelty, with an unexpected clarity. For that, and so many other things, I am grateful. Two days later, while at the airport to head home, I learned that Search and Rescue had indeed found Cindy at the bottom of the waterfall. Sadness overwhelmed me. I believed Matt when he said that her remains were most likely at the base of the waterfall, but I suppose I held a little glimmer of hope until I received confirmation. Tears welled up in my eyes as I messily told my wife an abbreviated version of what had happened over the phone. And then, I opened up my laptop and started to write. Because that’s what I do. This is my story, but it isn’t mine alone; it’s Tim’s and Jon’s, it’s Andrew’s, it’s Matt’s. It’s also Mount Whitney’s, and I suppose it’s the story of how we’re all linked together in some small way because of seemingly random happenstance. There are parts of this story that are happy, and parts that are incredibly sad. There are also parts that we can, and should, learn from. There are lessons here, and I hope we all learn them. Like never leave a teammate alone. It’s no secret that I advocate spending time alone in the wilderness, and I will continue to do so. But not in unfamiliar terrain or in dangerous conditions. The buddy-system was ingrained in me during my years as a Boy Scout, and I wholeheartedly believe that a lot of accidents and tragedies could be prevented if we had a teammate with us when we were exploring unfamiliar or precarious areas. Likewise, we cannot underestimate our objective. Early on in the planning phase, Tim told me that he knew a man who did this hike in ten hours- six up, four back. “People do this as a day hike. How hard or dangerous could it be?” That’s the attitude that gets people hurt, or worse. There’s no such thing as a beginner’s mountain, and we should do well to remember that. 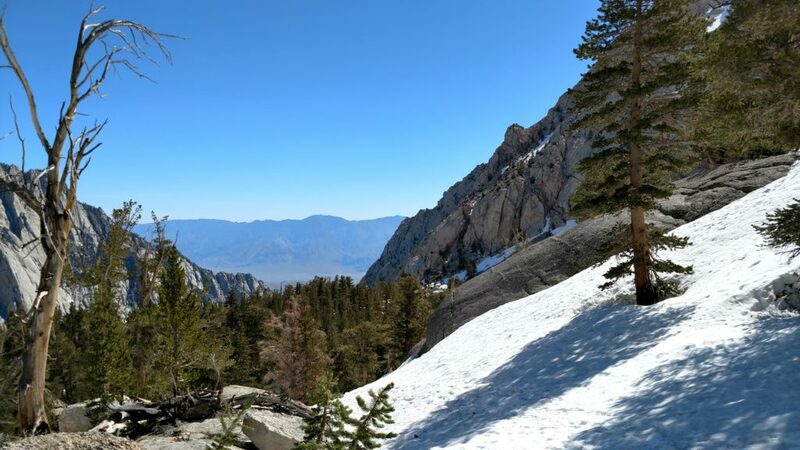 Yes, some people summit Mount Whitney in a day, but others die on the same mountain. Don’t be afraid to bail. Strip your ego out of the equation. Stop thinking about how far you’ve come to get here, or how much money you’ve spent. If it’s not safe to go on, if you’re too tired, if conditions aren’t right, or a member of your team can’t continue, it’s time to pull the ripcord. There is absolutely no shame in bailing out. Anyone who is going to judge you for staying safe isn’t worth your time anyway. It’s always better to not be on the mountain and wish that you were, than to be on the mountain and wish that you weren’t. Make sure you’ve filed a Flight Plan so that someone is expecting you or your party back, and knows who to alert if you’re not back by a certain time. Note your planned objectives, where you intend to camp, and what route you you’re taking. In an emergency, this information can be the difference between rescuers finding you cold and uncomfortable, or finding you with severe frostbite and hypothermia. Or worse. Stay connected to the community. There’s a reason we stop to talk to people along the way; they often have information we don’t. Even though we had no intention of summiting after waking up on the mountain, the intelligence that we got from descending hikers may have helped the others we spoke with determine the suitability of trying to ascend that day. Remember, you’re part of this community. That’s why we check on other campers and invite people to warm up next to our fire. It’s not something that you need when you’re at a designated campground and you’re surrounded by people. When you’re on the side of a mountain, however, it’s good to know, and to let others know, where help can be found. Bring the right skills. Once I returned home from this trip I immediately started to brush up on my navigation and first aid skills. We were all uncomfortable not being able to see the trail, and though I don’t know if improving my skill with a map and compass would make that any easier, I know that it wouldn’t hurt. Navigation is always a useful skill. Likewise, everyone should have a basic knowledge of first aid. Tim frightened me when he fell, at least until I saw he remained unhurt. But people can and do get injured on these kinds of excursions. Tim’s a medic and an ortho tech, so he’s usually the person I go to for first aid experience. He was fine, but what if something had happened to him? Everyone should know a little first aid, and have an idea of what to do in an emergency. So I’m brushing up on those skills. You should too. Some of you may be wondering, “would any of these lessons changed Cindy’s fate?” But I can’t answer that question. The truth is, sometimes accidents just happen. Sometimes tragedies occur, no matter how well we prepare. That doesn’t mean, however, that we shouldn’t prepare at all; it means that we prepare as well as we are able, and do the best we can in the situations in which we find ourselves. 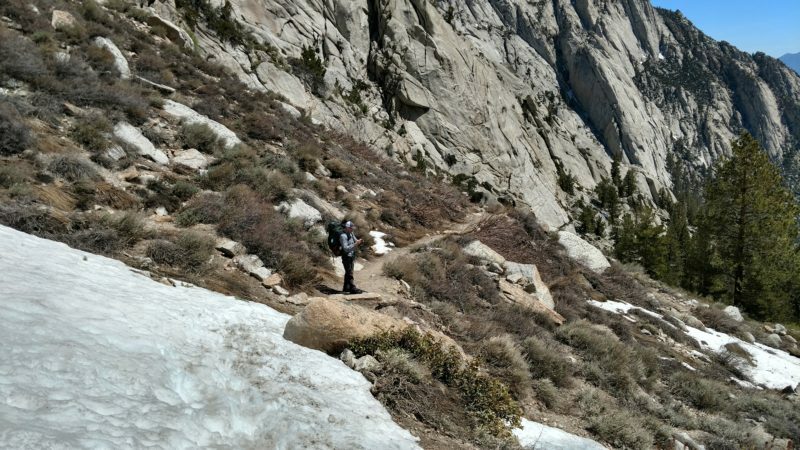 None of this is intended to frighten or discourage you from hiking Mount Whitney, or having any other outdoor experience. Despite the tragic narrative unfolding concurrent to my visit, I loved my time on the mountain, and I do plan to return and make the summit. That said, we must respect the power of the place and what it’s capable of. Everyone makes mistakes; I’ve been hypothermic, I’ve broken my hand, I’ve lost blood, and I have lived to tell the tales. I have been lucky, but I’ve also been prepared. Usually the mistakes we make are minor and we walk away from them relatively unscathed. But as a situation becomes more complex, dangerous, or unstable, our errors grow more precarious, with the potential for greater consequences. Tragedy isn’t usually the consequence of one large decision. It stems from several small, often seemingly inconsequential, choices that we make. These steer us toward the course we’re on, but few outcomes are inevitable. If you feel like things aren’t going right, are more dangerous than expected, or you aren’t up to the challenge at hand, stop and think about what you’re steering yourself toward. We are one of the few animals that have the cognitive power to stop and reflect on where we’re headed, stopping potential tragedies before they strike. Ask yourself, Are you overcoming adversity or biting off more than you can chew? It can be difficult to tell the difference, but it’s better to stop and reflect on it before moving forward, because you may not get a chance to look back in hindsight. It’s better to bail and live for another adventure. I’ve bailed out on a number of objectives and I feel no shame about it. It’s better to not be on the mountain and wish that you were than to be on the mountain and wish that you weren’t. So don’t let this member of our community, or any other, die in vain. Learn from this story. Stay safe out there. Adventure on. This post is the final part of a five part series. You can find all the posts collected here. Nice series. Well done Wade! Many thanks Dave! Always glad to hear that people are enjoying what I’m putting out there! 1) Learn basic navigation. Have a compass and the correct scale amp, and know how to use them. I would add, also, carry spares well wrapped up in your pack – you can lose a compass, and a map can get shredded in wind or destroyed by water. I often laminate a few crucial sections. 2) Learn remote first aid. You never know! 3) Never be afraid to bail out! 4) Stay tuned to the weather conditions – talking to others always helps. 5) Never be afraid to bail out!!! 6) Don’t get into something you do not have the skills for. Very nice series of posts – looking forward to others. Thanks Mick. I’m glad that you enjoyed the series, and I feel that we approach these situations in similar fashion. Upon my return I’ve really emphasized the notion of preparedness, even in myself. It’s been some time since I’ve had to make use of either my navigation or first aid skills. I’m in the process of knocking some of the dust off so that I myself feel more prepared! Very wise, Wade. Obviously, it’s worth keeping skills up to date – I have to do that with my first aid as an outdoor instructor, so I get to do a ‘remote first aid’ course every 3 years, and make sure I use my navigation skills as often as possible.